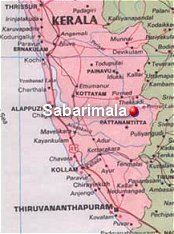 Sabarimala's main pilgrimage season is from 14 Nov to 20th Jan every year. Mandala pooja and Makara Vilakku celebrations comes during this period. Immediately after Mandala pooja, the temple closes for five days prior to re-opening for the the Makaravilakku session. The most auspicious moment is `Makara Vilakku' celebrations on `Makara Sankranti' day which generally falls on Jan 14th. 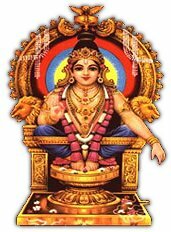 On this day, at dusk, Lord Ayyappa's idol is adorned with Thiruvabharanam (Divine Ornaments of Ayyappa) brought from the home of his ancestors (Pandalam Maharajah at Pandalam Palace). After this the doors of the Sanctum Sanctorum are thrown open for the 'Aarti'. It is at this time that the Divine Light `Makara Jyothi' is visible at `Ponnambalamedu". However, the rush of pilgrims is so much on that day that many pilgrims prefer visiting during other days/seasons. In order of `rush' of pilgrims, the most crowded day is Makara Sankranti. In fact, during the period between Vrischikam 1st and Makarom 1st (aprox. 14 Nov to 14 Jan) there is a heavy rush of pilgrims. There is insufficient place for car parking at Pampa and at times the cars have to be parked many many kilometres away. Onam and then Vishu also is special for sabarimala. Thiruvonam (falls approximately during the third week of August) is in the Malayalam month of Chingam. Vishu (Apr 13/14/15) is in the Malayalam month of Medam. These are again days when a fairly large number of pilgrims visit the temple. During Vishu, the temple remains open till 20th of the month. During the other monthly opening days of the temple, the flow of pilgrims is less. The surroundings of the temple are much more peaceful and one can visit the temple more peacefully and leisurely. The shrine of Lord Sabarimala Ayyappa is situated in a forest, in Pathanamthitta District of Kerala, close to the boarder with Tamil Nadu. The place is accessible from west through Kottayam, Palai or Pathanamthitta and from the east through Madurai. On western side motorable road is available upto the banks of river Pampa. The last 5 kilometres will have to be covered on foot. The shrine at Sabarimala is not open for darshan throughout the year. It remains open for few days close to the end and beginning of each Malayalam Calendar month. This coincides with the middle of each English Calendar Month. Besides, there are few other occassions like Mandala Vilakku (Close to Dec 25th), Onam etc.. The information regarding these days is available in Malayalam newspapers and calendars. Women between the ages of 10 and 50 years are not supposed to visit the shrine. The shrine is situated on a lofted platau. There are three entries consisting of eighteen steps each on the eastern, northern and western sides(Front, Left and Back). Entry through the main holy steps in the front is restricted to those carrying the mandatory "Irumudikkettu" (head load of offerings and provisions). It is customary to wear dark clothes - a reminder of Ayyan's expedition. This holy steps are used only twice during a visit namely go and return. The devotees are required to break a cocoanut at the appointed place before entry to the steps. Pilgrimage to Sabarimala should be undertaken after 41 days of rigorous purifying rituals. These and the journey by beginers should be under the guidance of a veteran referred to as Guruswami. Pilgrims visit major temples of Kerala as an accepted custom. Although the area is covered by Cellular Telephone service, the use is restricted during main seasons, as the ringing and talking can disturb the contineous chanting of "Swami Saranam." Scattering of garbage, especially non-bio degradable, littering, consumption of alcohol & non-vegtarian food, Smoking etc are punishable Offences. Information centres and counters are available at important points for assistace to pilgrims, including announcements for paging for individuals separated from their groups.